A wonderful collaboration by two of my favourite musicians, Nils Frahm and Ólafur Arnalds. This is a fully improvised works recorded in eight hours with no overdubs and no edits. Recorded in July 2015 in Durton Studio in Berlin, the session was initially a planned short video recording. 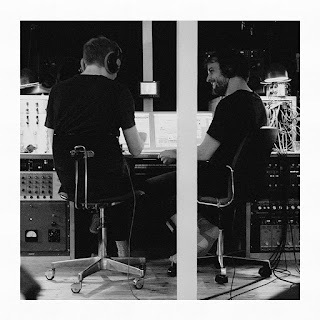 The duo has has invited Alexander Schneider to record an improvised session to promote the releases of their recent studio collaborations. "We felt there was something special in these songs. They arrived so quickly and so unexpectedly, and at the end of the night we had all this music that sounded unfamiliar even to us - loudly asking to be included in this collection, especially because our friendship and collaboration originally started with live improvisation on stage." The song's titles referred to the time they are recorded. The first song started at 20.17 and the last song recorded at 03.06. In between, Nils cooked them a supper of salad and pizza (it looks yummy! ), as seen in the video above. Watch the video to fully appreciate the music and the 'magic' of their improvisation.